Designed for excellent performance, converts 120VAC into 13.8VDC. 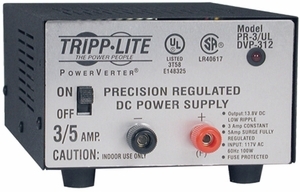 The integrated circuit of this DC power supply maintains first-rate regulation of output voltage. With low-noise operation and high-quality filtering, this unit is ideal for home use of single-sideband CB radios, mobile audio equipment, point-of-sale displays and aquariums.